If you are just looking to just snip the end off some EL Tape then this guide is probably a bit too much. My advice would be to use sharp scissors and remember to reseal it afterwards with superglue or clear nail varnish and just get on with it. But if cutting EL Panels is the only way forward for you then pay close attention! Under my direction i tried to trick her into making every classic mistake i know of when cutting EL Panels(that might be a terrible thing to do – but i was doing it for this guide… to help YOU!!! Do I need to point out that each of the 4 shapes must obviously end in a connector? b) Also by fluke, or maybe she new, that you need to try and get as much of this electrode into your design as possible to make the el panel glow at its brightest. e.g with the letter V there is only a small section of outer electrode near the connector and then the panel flares out wide – i was convinced this would mean there is not enough outer electrode on this piece to make it all glow strongly. So if the image is drawn on the back, when it is cut out YOU WILL GET A REVERSE IMAGE of what you are trying to achieve – OUCH! I am usually a big fan of the scalpel for arty projects but for EL Panel it has to be sharp scissors. Also i think its best for the panels to be a bit warm when they’re cut, you get cleaner cuts. You certainly get worse cuts if the panel is freezing cold. The EL material is sensitive to heat so don’t go mad, just take the chill off it, warm it on your tummy or at most in a cloth by a radiator. While cutting the sharp point of the V, the two scissor cuts didnt quite meet, and the shape was hanging by a thread. 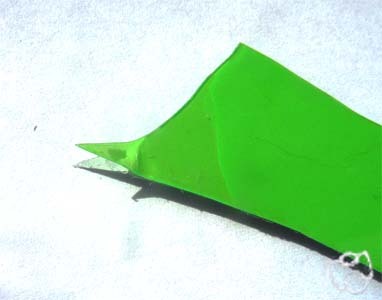 in this case it was almost 1cm X 5mm triangle – it can be repaired somewhat with superglue, or even but its never as good again and its best avoided. Happily, delaming doesn’t happen too easily. I find using a scalpel can quite often delam around the cutting edge a millimetre or two. If you are using a scalpel (which you have to for some shapes) then cut at a 60º angle; the piece of EL Panel inside the angle will be fine and the outside bit delams really heavily. These are the only 2 ways of accidentally delaming i can think of. 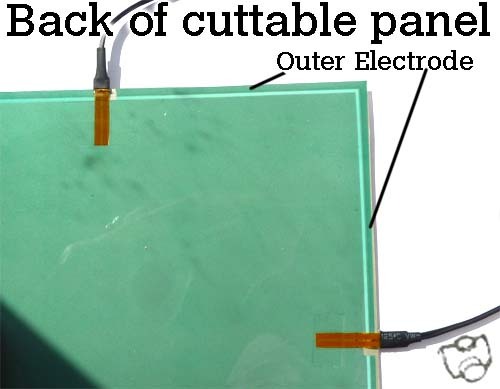 If you try to delam or peel apart the EL Panel at the cut edge – youll find its near impossible. But don’t think that means it shouldn’t be sealed. Over time, moisture can get in and this can cause it to peel apart. Used the superglue trick before to insulate segments of El wire..
Another worthwhile method is to get hold of some car mirror glue that sets under UV light, this also works. Re. delamination, essentially the problem is that the ITO has to be in direct contact with the phosphor. I think they use a variant of UV setting adhesive to ensure this, so if you can get some and use it the panel should then work again.